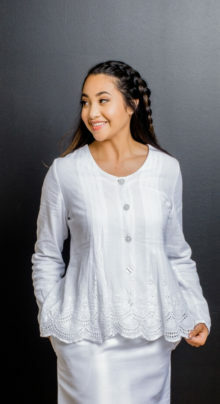 Soft, open front cardigan hits at low hip and sports handy pockets and ribbing around neck, bottom and cuffs. *70% Viscose 30% Nylon *Wash cold/ lay flat to dry. This beautiful vest will compliment anything in your wardrobe. Add it to your favorite dress or skirt, even jeans. 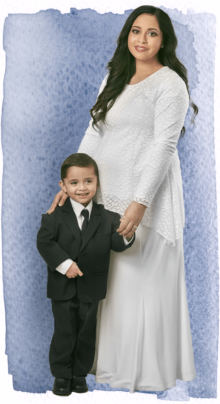 The soft netting with soutache cording is fully-lined with light weight knit and is accentuated with a soft scalloped edge in the front. One hook closure at the top front. 30″ length from back of neck to the bottom. Shown with long sleeve T and Shantung skirt. Stunning with Starburst dress, too. Beautiful, flowing, six-gore skirt is fully lined with a contemporary flared bottom and comfortable elastic waist. Made of the same fabric of top #1077PT. One side-seam pocket. Simply perfect with any blouse or sweater. 100% Polyester. One side seam pocket. Light-weight lace vest has a V-neckline and one button closure. Side vest open above pockets on dresses and skirts. Very flattering over skirts, dresses or pants. Just enough to change any wardrobe pieces. 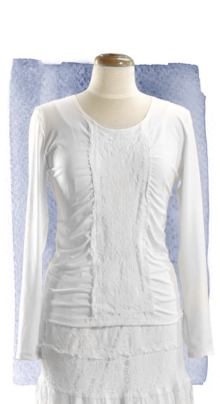 Soft, contemporary knit top with front ruching and long sleeves. 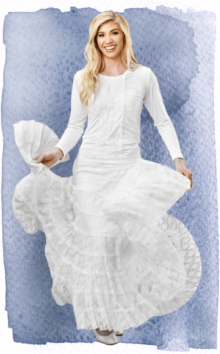 Beautiful with white Temple skirts, jeans or business slacks. A perfect outfit when combined with the White Elegance broomstick skirt. 92% Polyester 8% Spandex.